Paul Peterson photo Calumet guard Matt Ojala elevates over the defense of Brandt Tembreull of L'Anse Monday night in Class C district play in L'Anse. The Copper Kings scored a 53-25 win. 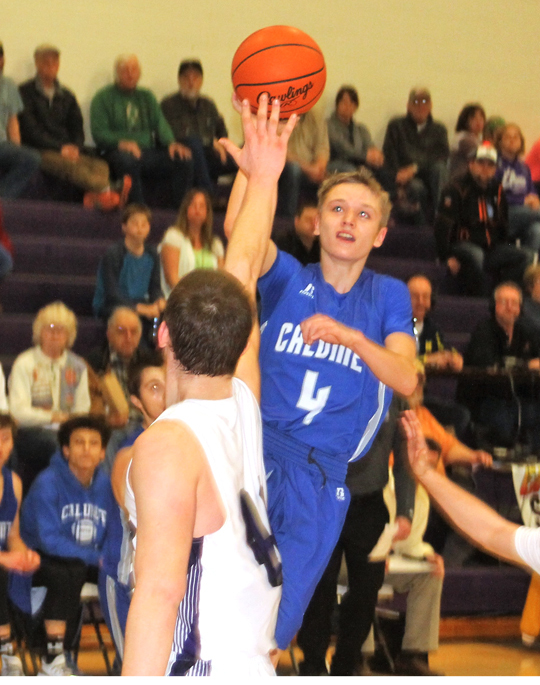 L’ANSE — The L’Anse Purple Hornets hung tough for one quarter against favored Calumet Monday in Class C boys basketball district tourney action. Then the roof fell in on the Purple Gang in the second quarter as the Copper Kings used a smothering defense to put the game way. 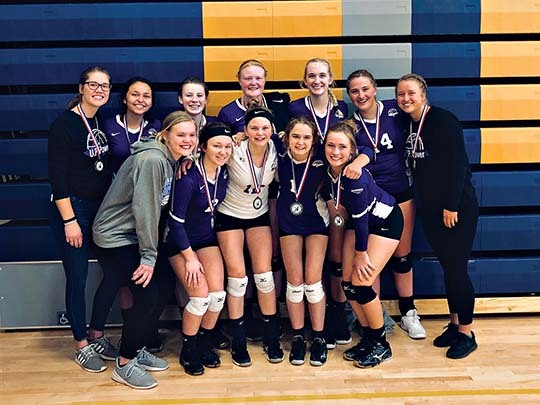 “We talked about staying focused,” CHS coach Mike Ojala said after his team’s 53-25 victory. “And L’Anse has talented kids who can play. A 19-0 run by the northend team to begin the second quarter turned a close 14-10 lead into a 33-10 rout. For the game, the Hornets could manage to make just 8 of 46 shots from the field. The Calumet trapping defense, led by guards Wyatt Loukus and Matt Ojala, forced numerous LHS turnovers. Loukus knocked down a pair of 3-point baskets in the first quarter, while Ojala canned a pair of triples in the second period. Calumet, which earned the right to host Hancock Wednesday night for the district crown, is now 15-6 on the season. The West-PAC champions kept the pressure on in the second half, allowing L’Anse just 12 points. Matt Ojala paced the winners with 15 points. Loukus was next with 12 points and David Kaipio managed 10 more. L’Anse, closing at 6-15, received eight points from Logan Fish. Brandt Tembreull put in six points and had a game-leading 12 rebounds, drawing Koski’s praise. Mike Ojala said Hancock is a very familiar opponent, having faced the Bulldogs three times this winter. CALUMET — Loukus 12, T. Ojala 4, Twardzik 4, M. Ojala 15, Kaipio 10, Hyrkas 3, Torola 2, Helminen 3. FT: 5-6; Rebounds: 27 (Loukus 6); Fouls: 15; Fouled out: None; 3-point FG: M. Ojala 4, Loukus 2, Hyrkas 1, Kapio 1. L’ANSE — Fish 8, Parker 4, Rajala 2, Tembreull 6, Waranka 2, Sanregret 3. FT: 6-11; Rebounds: 25 (Tembreull 12); Fouls: 14; Fouled out: None; 3-point FG: Fish 2, Sanregret 1.